Although the difference between the rhetoric of politicians and statistical reality is not a new theme, it’s one most Oklahomans associate more with the government at the federal level than state level. However, political theater in Oklahoma is at an all-time high. Oklahoma Attorney General Scott Pruitt and Gov. 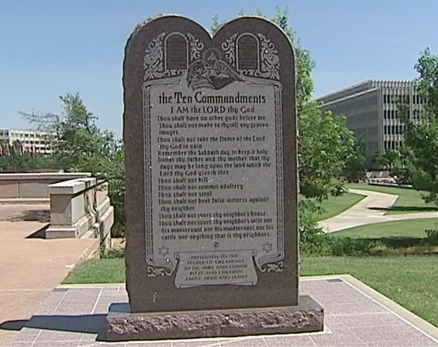 Mary Fallin continue to fight for the Ten Commandments monument to remain at the State Capitol despite the Oklahoma Supreme Court declaring that placement unconstitutional. While this sideshow is being played out, more pressing needs are overlooked. Oklahoma sits near the bottom of The Human Development Index for U.S. states. The HDI is intended to measure health, education and opportunity. In that respect, Oklahoma ranks a low 45 of 51, beating only Louisiana, Kentucky, Alabama, West Virginia, Arkansas and Mississippi. Ten Commandments monument outside the Oklahoma State Capitol. Similarly, FiveThirtyEight.com and StateIntegrity.com both rank Oklahoma as one of the more corrupt states, rating the state 30 and 40 respectively with 50 being most corrupt. The United Health Foundation ranks Oklahoma 46 out of 50 in terms of quality of healthcare. According to the 2011 U.S. Census, Oklahoma ranks 32 out of 50 for people with high school degrees, and 42 out of 50 for those with advanced degrees. Bureau of Justice Statistics show Oklahoma is leading the nation in prisoners and in police homicide rates. Most people will agree that healthcare and education are good and crime is bad, and regardless of political affiliation, it is not hard to find damning statistics and information in virtually any metric comparing the states. However, the data almost universally points in one direction: Oklahoma is near the bottom for progress and near the top for rot. Sharing these statistics with the people who live here initially elicits shock and then, frustration. Poor roadway quality seems to be the only indication of the state government’s true nature that most people understand or even care about. Change is possible. In the last gubernatorial race, voter turnout was possibly the lowest on record, at least since 1978. The issue is not Republican vs. Democrat. The issue is a populace of trusting people who don’t vote. Of course, the lack of pluralism in Oklahoma politics is probably not helping. Besides voting, the best thing any Oklahoman can do for the state is to spread the word about what the state government needs to do.